2221 YONGE – A STAR IS SOON TO SHINE IN MIDTOWN TORONTO! ≈ Comments Off on 2221 YONGE – A STAR IS SOON TO SHINE IN MIDTOWN TORONTO! This fall, Toronto’s prime Yonge and Eglinton address will become a lot more exciting, when Tower Hill Developments officially launches sales at 2221 Yonge Condominiums! This anxiously awaited residence will be one of the most distinguished in the city, with an all-star team at the design helm. Manhattan-based Pei Partnership Architects collaborated with Toronto’s Quadrangle Architects to create the stunning exterior that will soar 50 storeys from a six-storey podium. 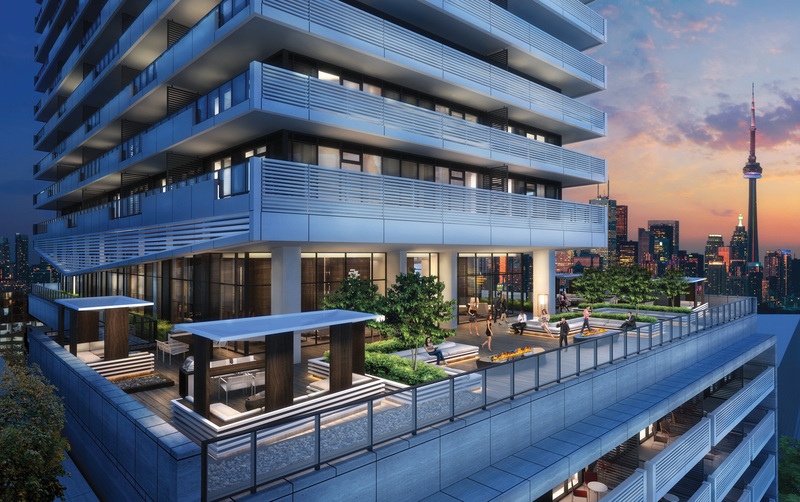 2221 Yonge will feature gorgeous articulated balconies and recessed terraces – generous spaces that offer both exposure to the outdoors and privacy. The design of 2221 Yonge is actually inspired by Tower Hill’s own East and West apartment buildings at Spadina and St. Clair West, which have a significant presence in the area. These iconic buildings were developed by the grandfather of the firm’s founding family. The new condominium will feature elements of these modernist-era landmarks that will set it apart from the surrounding glass towers. Interestingly, the Pei Partnership founders also have a family connection to Toronto. Their father, I.M. Pei, was the architect of our striking Commerce Court West, South and East buildings, which are icons in the city’s Financial District. He was also the architect of the stunning pyramid at the Louvre in Paris, along with numerous other world landmarks. None other than Munge Leung is handling 2221 Yonge’s spectacular interiors to appeal to a market of young, vibrant buyers who cannot afford or do not want to live downtown. Residents will have the convenience of retail venues at ground level, plus a magnificent array of amenities in Halo, a lounge on the 56th floor. Already the talk of the town, the condominium will include a fabulous resort-inspired residential spa with a three-pool oasis (warm, hot and massage jet). Suite prices start from below $300,000! You just have to see 2221’s sales arcade and model vignettes to experience the excitement. For more information, visit in person; check out the website at 2221yonge.com or call 647-350-2221.